A sympathetic, compassionate, and inspiring guide for parents. Greg and Lynn McDonald had never interacted with members of the LGBTQ community until they discovered that their son was gay—and without resources or support, they had no idea how to handle this discovery. At first they tried to “fix” him, to no avail. But even in the earliest days of their journey, the McDonalds clung to two absolutes: they would love God, and they would love their son. This book follows the McDonald family’s journey over the next twenty years, from a place of grief to a place of gratitude and acceptance that led the McDonalds’ to start one of the first Christian ministries for parents of LGBTQ children. Based on their experience from counseling and coaching hundreds of struggling Christian parents, they offer tools for understanding your own emotional patterns and spiritual challenges. They also help you experience a deeper relationship with God while handling difficult or unexpected situations that are out of your control. You will discover tested principles, patterns, and spiritual lessons that can change the way we all see our families, and help Christians at large think though Christ-like ways to respond to the LGBTQ community. Written in an unvarnished, honest, reassuring, and relatable voice, this is a practical guide for parents and a blueprint to learning to love God, the people He created, and the church, even when they seem to be at odds. If you are a Christian parent whose child has recently come out to you, please, please take the time to read this account of Greg and Lynn’s efforts to reconcile their faith in Jesus Christ with their desire to love their son well. Had my husband and I found a book like this after our 12-year-old son came out back in 2001, it very well would have changed everything. We would have recognized ourselves in the McDonalds’ fears and anxieties, and through their gentle promptings learned to listen both to God’s voice and to the cries of our child rather than hearing only our own panicked thinking. This unflinchingly honest & humble telling effectively demonstrates how so many of us who love our children [passionately] can, unintentionally, cause grievous harm because of our desire to obey God’s Word and to see that our children do, as well. If you want to remain committed to your faith while also preserving your relationship with your child, friend or family member, set aside a few hours to consider what Greg & Lynn have learned. What you discover might just save a life. I met Greg and Lynn McDonald a few years ago and after hearing their story, I was impressed. Three years later, I am even more impressed. In their book, Embracing the Journey, Greg and Lynn provide a compelling description of a challenge faced by more and more people in the modern church: how to love God and their gay child without losing their faith or their relationship with either. Each page is filled with striking honesty and first-century courage. I predict this book will be an important and helpful resource for a very long time. "What a magnificent story of respect, honor, commitment and deep love. Thank you, Greg and Lynn, for allowing us to see your openness and humility to learn, grow and be real. The truth that you have discovered and experienced about God, life, and enduring love is a message that all families need to hear. Thank you for unconditionally loving your beloved son and the people that he holds dear in his life. I will be recommending this book to all the parents I know who are on this very sacred journey." Kathy Baldock Executive Director of Canyonwalker Connections and author of "Walking the Bridgeless Canyon." Greg and Lynn McDonald have not only written the book they wished had been available to them years ago, they now offer their insights to conservative parents who have walked and will walk this path when they find out their child is LGBTQ. "Embracing the Journey" is an excellent resource filled with raw and honest accounts of their mistakes, as well as their good decisions. Each chapter ends with a recap of insights and challenges, so the reader might consider how best to apply the information to their own situations. For decades, Christian parents have been offering shaming books to their children, hoping to "fix" them. Together, Greg and Lynn have created the book that LGBTQ people will be handing to their parents, asking them to read it so that families can be healed, and the lives of LGBTQ people may thrive in relationship with God. David and Constantino Khalaf, authors of Modern Kinship: A Queer Guide to Christian Marriage. "Writing with both confidence and vulnerability, the McDonalds have given us a much needed resource which will help not only Christian parents of LGBTQ children, but for the children themselves. 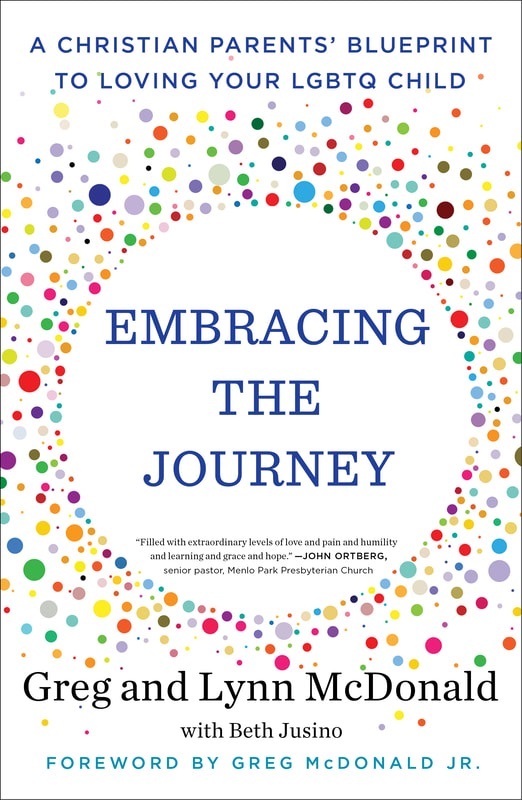 For parents, Embracing the Journey provides a thoughtful guide to reconcile their faith with the reality of having an LGBTQ child. Children will benefit from seeing the journey from the other side, learning how to better appreciate the steps their parents may take." I know Greg and Lynn McDonald, have shared dinner with them and their son, heard their story, received calls and emails from them as they search for help for others in need. Now I have read their book and I love it. I recommend it because I trust and know them. They have a powerful story fueled by their passion for Christ and love for family. This book is great for parents, pastors, LGBTQ people, and anyone who wants to know how to move “gay” from a long list of issues to a compelling story about a community and people group we need to know better and love generously. I pray this book and these people inspire you as much as they have me. This a must read for all parents! So grateful for the courage and boldness of Greg and Lynn McDonald for sharing all the hard-learned lessons of their journey to truly love and support their gay child, while still holding on firmly to their faith. What a wonderful resource for parents, maybe even a life preserver for those drowning in religious teachings, traditions and dogma. This is a resource I wish I had had as a parent attending a theologically conservative church prior to my children coming out. I do believe “Embracing the Journey” is a true game changer! This book is a true testament to God’s desire to transform today’s Church to learn how and finally commit to fully loving everyone just like Christ first loved us, one parent at a time! Authors of RISKING GRACE--Loving Our Gay Family and Friends Like Jesus. Sharing our stories is important. Vitally important. So many parents of LGBTQ children feel utterly alone. But you are not alone. Which is why the McDonalds are sharing their story, their journey, the changes in their lives. Because no matter where you are on your journey, Greg and Lynn have been there too. They asked the same questions, struggled with the same emotions. But also--wait for it--experienced the love and peace and joy that is also part of the journey. We know. We're on this journey too. Copyright © 2019 Embracing the Journey Inc. All rights reserved. Receive updates with blog content, media links, book launches, speaking engagements and events.